Switzerland has sent athletes to every Olympic Games since the first Games in 1896. Switzerland boycotted the 1956 Summer Olympics in Melbourne but the equestrian events for those Games were held in Stockholm, Sweden earlier that year. The Swiss dressage team won a bronze medal. 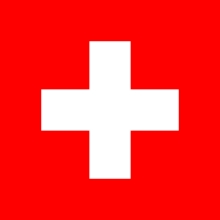 Switzerland has hosted the Games twice. They hosted the 1928 Winter Olympics and the 1948 Winter Olympics. Both were in St. Moritz. Swiss athletes have won a total of 181 medals at the Summer Olympic Games. They have won 127 at the Winter Olympic Games. "Swiss Olympic Association". International Olympic Committee. Retrieved 2007-10-09. This page was last changed on 24 April 2019, at 13:06.